My work week at Westport Beach store consists of 3 days for 3 hours each day. I have set up a massage studio here in the park, as well, offering Chi massage to guests and locals. Both jobs keep me pleasantly engaged. Today was a store work day, 9am to 12 noon. So after an early morning walk and wander at Abalone Point, I walked down the hill to the tiny store. 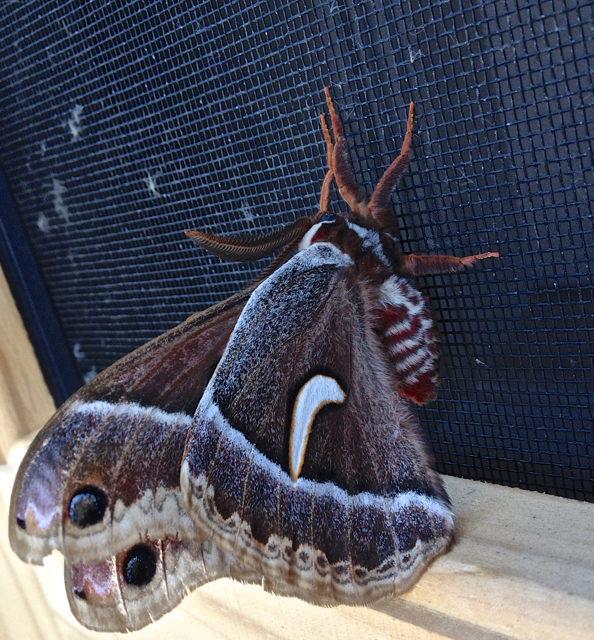 Reaching for my key to unlock the door I spotted this creature, this absolutely stunning creature on the screen door. 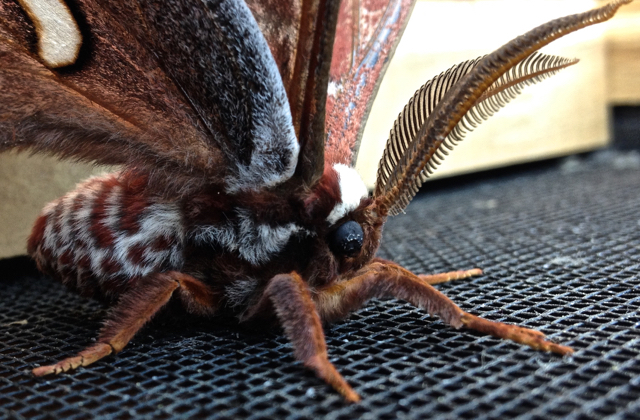 I immediately got my iPhone and captured some closeups of the Ceanothus Silk Moth. It lives but a week or two and has atrophied mouth parts so it cannot eat. Silk moth’s sole purpose is to mate, lay the next generation’s eggs and pass on. I wonder if Silk Moth is happy and enjoys its brief life here on Earth. So very pretty, good pictures you really captured him/her in all it’s glory. Made me think of our many explorations in the wilds of Pennsylvania. Oh, so beautiful – cute and furry, too! You’re an amazing photographer, Annie. Alice ~ so wonderful to be hearing from you again. I miss you and think of you often. And no food…..but the caterpillar stage really packs it in.